How did we get our Bible, especially the English Bible? REVELATION After the fall of man in Eden, and his becoming a sinful being alienated from God, we notice the first fruit of this separation was that Adam & Eve hid from the presence of God in Eden (Genesis 3:8) and in effect, lost communication except where now grace must and would seek them out. From then on, God began a work to reveal Himself and His glory afresh to mankind, through the calling of Abraham, the birth of the nation Israel, and ultimately the arrival of the Messiah through that chosen people. None of this was a surprise to God of course, and He set forth His plan and foretold much of it as the truth was unfolded. Revelation is God revealing Himself to mankind, and we are blessed to have this record written down by faithful witnesses, led of the Holy Spirit to record the God-breathed record (2 Tim. 3:16-17). Due to the fall and his subsequent and universal sinful nature, man is unable to grasp spiritual truth or to have fellowship with his Maker (1 Cor. 2:14). In order to know God, the new birth, forgiveness of sins, and illumination of the Holy Spirit are paramount. The story of the bible is that story- of redemption, grace, and - centrally – it is about the person and work of Jesus Christ. The Old Testament looked forward to Him, His coming, and His atoning work & resurrection. The New Testament gives the record of these momentous events, looking back and also explaining the birth of that new thing, the Church, which is the body into which saved men and women were brought into, who came to know God through faith in Jesus Christ. These are the most important issues man must face, and it is essential to know where to find the answers. PROGRESSIVE REVELATION In the beginning, God created the heavens and the earth (Gen. 1:1). The crown of this work was man - being created from the dust (see 2:7), in God’s image, on the 6th day. As mentioned above, the fall of man, and his alienation from God, led to the need for divine intervention. Written in the latter 1st century, Hebrews 1:1 tells us the progression of the revelation of this work of God towards man: “God, who at various times and in various ways spoke in time past to the fathers by the prophets, has in these last days spoken to us by His Son (literally IN SON).” Or to put it another way, God spoke, as a SON. He spoke to the fathers (like Abraham) and through the prophets (like Isaiah) and inspired men to record those historical events. Later He spoke with finality in the person of His Son. The Bible is that inspired record. In the Bible sense, Inspiration means God-breathed (Gk theopneustos from theos-God, pneumos-spirit/breath). God spoke through holy men (2 Peter 1:21), the very words He wanted to convey. This revelation therefore, being God-breathed, was without error in its original autographs. The authorship and transmission of scripture finds its basis in this “inspiration.” Believers hold to "Verbal Plenary Inerrancy" which means that one believes all of the Bible is inspired from its historical accounts, down to the very words and letters of Scripture. It is not merely inspirational, nor a book containing mere concepts, but is fully inerrant. For example, the testimony of Jesus Himself tells us that (John 5:46) Moses is the human author of the Pentateuch (Genesis – Deuteronomy). Perhaps he began to write as early as 1440 BC., though he wrote of events that were much earlier (ie…creation). How would he have known what to write? Inspiration. God revealed it to him. This is accepted by faith. And early on we read Moses gave the first prophecy of the coming Messiah (Genesis 3:15). He records the account of Noah & the flood. Of interest to the scientist should be the fact that 75% of rock on the earth is sedimentary. What this means is that it was laid down by the action of water-worldwide! The existence of huge buried Fossil Fuel fields throughout the earth, which came from living organic materials, suddenly buried in a cataclysmic event, give great credence (as if needed) to the biblical account of Noah’s flood. These are indelible marks of inspiration as God’s word to man progressed, in a written record. Even in Moses’ day, writing was highly developed. Archaeologists have found writing on stone, clay tablets, animal skins, papyrus, etc. In Deuteronomy 10:2, God told Moses to place the written tablets of the commandments into the Ark of the Covenant. The Levitical priests took care of these items, and going forward God revealed more and more through the fathers and prophets of the nation of Israel. To them and through them He gave the scriptures, the covenants, the promises. (See Romans 3:3, 9:4-5) After Moses, the next leader of the nation was Joshua, and to him was confirmed the value of scripture as he was told by God in Joshua 1:8: “ This Book of the Law shall not depart from your mouth, but you shall meditate in it day and night, that you may observe to do according to all that is written in it. For then you will make your way prosperous, and then you will have good success”. The book of God was valued indeed. As the history of Israel unfolded, more portions were added, including Psalms, Prophets, Historical narratives, and books of Wisdom. Ezra, David, Solomon, Isaiah, Daniel, Ezekiel, and others wrote down precious God-breathed words. These “Old Testament” writings would close in the 5th century BC with the book of Malachi. While a detailed look at this is beyond the scope of this article, the Lord Jesus Christ affirmed 39 books of the Old Testament in the day in which He lived and ministered on earth. A Master's Seminary article by N. Busenitz (Why These 66 Books) says: "A study of the gospels shows that, throughout His ministry, Jesus affirmed the Old Testament in its entirety (Matt. 5:17–18)—including its historical reliability (cf. Matt. 10:15; 19:3–5; 12:40; 24:38–39), prophetic accuracy (Matt. 26:54), sufficiency (Luke 16:31), unity (Luke 24:27, 44), inerrancy (Matt. 22:29; John 17:17), infallibility (John 10:35), and authority (Matt. 21:13, 16, 42). He affirmed the Law, the Writings, and the Prophets and all that was written in them; clearly seeing the Old Testament Scriptures as the Word of God (Matt. 15:16; Mark 7:13; Luke 3:2; 5:1; etc.). Significantly, the first century Jews did not consider the Apocryphal books to be canonical. And neither did Jesus. He accepted the canon of the Jews as being the complete Old Testament. He never affirmed or cited the Apocryphal books – and neither do any of the other writers of the New Testament." And the 27 books of the New Testament are inspired because the Lord Jesus Christ authorized His apostles to write the New Testament. In John 14:25–26 the Lord said: “These things I have spoken to you while abiding with you. But the Helper, the Holy Spirit, whom the Father will send in My name, He will teach you all things, and bring to your remembrance all that I said to you.” That is a strong argument for their canonicity. TRANSMISSION We now jump from the history of the OT writings, to consider how we have them in our hands. This began with a special group of priests, called scribes. They made new copies of the scriptures, as the older copies wore out. They were copied on various surfaces, like tanned animal skins and later on a paper-like material called papyrus which were rolled into scrolls. Scribes were VERY diligent in their work. They had meticulous requirements including the washing of hands, counting of the very letters in a document (if the count did not match their source text count, the scroll would have to be started over). Early Hebrew copies would have had no vowels, which was a later addition. But their work was taken very seriously, as the nation highly esteemed the writings of Israel's heritage. David would himself write “For ever, O Lord, Thy word is settled in heaven.” (Psalm 119:89). They took great care to respect the Hebrew name of God, YHWH, so much so that in later years the scribes would add the vowel points for the generic word for God (adonai) to the consonants of YHWH ( יהוה ) in the text, so they would know when reading it to speak out loud Adonai and not say YHWH. After Hebrew ceased to be a known language, it was in the 20th century that this vowel pointing issue was understood. And though this is outside the scope of this paper, this story would explain the difference between pronouncing “Jehovah” in English as compared to the more accurate “Yahweh.” We believe it is acceptable to use either, just as long as reverence is included and a humble recognition that we do not know the pronunciation - not for sure. Anyway, when making copies, honoring older worn out texts led scribes to dispose of them respectfully, not by destroying them, but by burial, often in clay jars. This may explain the existence of the Dead Sea Scrolls, discovered in Qumran in the mid 20th century. Of note, these scrolls, particularly the famous Isaiah scroll varies little with the Hebrew Masoretic texts that were copied more than 1000 years later. This testifies to the careful preservation of the scriptures. The Dead Sea Scrolls date as far back as 250 BC, while the earliest manuscripts we have of the New Testament are from 200 AD. THE GREEK LANGUAGE Also at this time (200 BC) something of great interest was taking place. The world had been conquered a century earlier by Alexander the Great . (See Daniel 2 and the significance of the 3rd of the Gentile world powers) With his conquests the Greek language became (like English today) the widespread language of commerce and education. The details are not well known but 72 scholars from the Hebrew people came to Egypt and for the library of Alexandria and were tasked with translating the Hebrew scriptures into Greek. This is the origin of what we call the LXX or Septuagint (LXX means ‘70’ though there were perhaps 72 scribes not 70). This may have been the first translation of scripture into another language. 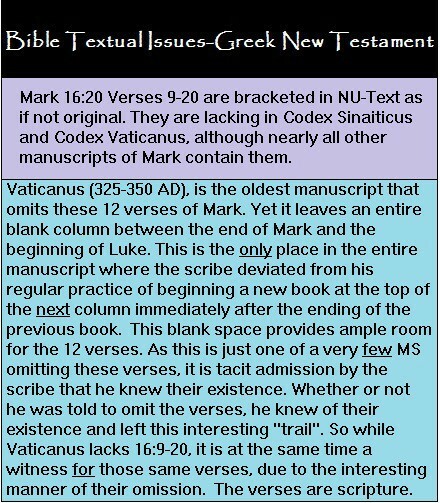 Of interest is that the New Testament writers are shown to frequently quote from the Septuagint, telling us it was a more accessible version to them, than their own Hebrew/Masoretic text. This document, the LXX spread throughout the Roman Empire. As we think of the earliest books of the New Testament, they were written in Greek with ink on papyrus sheets or rolls beginning in the late 40’s AD, and the last writings of John before 100 AD. In this remarkable and short time period, the New Testament writings were written, copied, and spread throughout the Greek speaking world. The papyrus would not last long even under ideal conditions, and it is to the numerous copies we are indebted to the preservation of the NT. Most OT books were written in Israel with the exception of Daniel, Ezekiel, and Esther. The NT authors all had a Jewish author, with the notable exception of Luke who wrote his gospel and Acts and may have been the transcriber of the epistle to the Hebrews into Greek. With the birth of the Christian church in Acts 2, where God took from Jew and Gentile and formed that new body, letters written by apostles became an important means of communication to the scattered assemblies of believers. For example, Paul wrote a letter to the church in Rome (Romans), Peter wrote to Christians in Asia Minor (1 and 2 Peter). These would have been written on papyrus. We find in Colossians 4:16 that it was common practice to read letters written to other assemblies of believers. This was the early impetus for the copying of the New Testament letters and books. Over time they were compiled, and under the supervision of their ultimate author (God), they were eventually collected, identified (they were scripture when written-not when canonized) as scripture, and brought together in compilations. Eventually this became the New Testament, under the supervision and sovereignty of the Author, God. It is believed that Athanasius in the early 300's AD was the first to actually list the 27 accepted books of the NT though this was not a church council that decided it. It is important to see that the writings did not become canonical (ie…decided by man to BE scripture) when some church council met to identify what was scripture and what was not. Under the guidance of the Holy Spirit, the believers understood what was apostolic, what was scripture, and they recognized it as such. They didn’t determine it, they recognized it. It is true some sorting took place, as some books were spoken against, and it took time for them to be accepted (like 2 Peter, 3 John). Others were at first accepted by some, like the Shepherd of Hermas, and later rightly rejected by all. Other excluded books were called the pseudepigrapha. These books (like a so called Gospel of Thomas or of Barnabas or Peter) had supposedly (ie...psuedo) been written by an apostle but upon examination, it was demonstrated that the real author had only used (pseudo) the name of the apostle and exposed as fraudulent. EARLY TRANSLATIONS There are early New Testament scriptures in Syriac, and Latin, and other languages. How did this come about? The same driving force that compels work today - like Wycliffe Bible Translators. The command of God to “Go ye therefore and make disciples of all the nations” was, and is, best accomplished by giving men the Word of God in their own languages. The various vernacular languages of the first century soon had copies of these writings of the New (and Old) Testament. In Europe, especially with the dominance of Roman culture, the Latin Vulgate became a primary NT text. Jerome was an early scholar and in the late 4th century he completed that Latin text under the direction of the Bishop of Rome. As a side note, this period in history also shows the growth of the power of the Bishops, especially as power became consolidated in Rome, which along with the development of what later became Roman Catholicism, also led to the rise of the papacy. 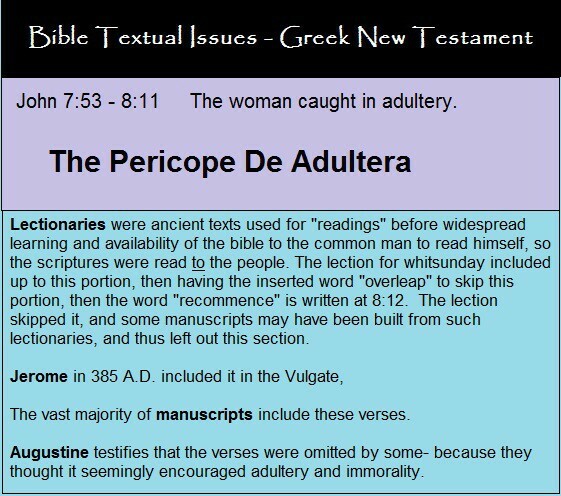 Under the auspices of this unfortunate organization, the texts of the bible would be kept under wraps with even the priesthood of the church of Rome having limited access, and the dark ages hindering the true church’s (ie..saved people) access to the Bible. But the monasteries continued their work, and somewhat like the Hebrew scribes of old, monks were often kept busy in the copying of the manuscripts. In the 5000+ extant manuscripts & portions of the NT known today, much is owed to the scribes of the monasteries, though they were not alone in the work. There were official copies made (like those per an edict by Constantine) and rich people could have access to their own copy as well. These unusual documents would survive in bits and pieces. The post-reformation period of the 1500’s & forward saw an explosion of the recovery of the ancient Bible manuscripts and remnants of texts. JOHN WYCLIFFE & WILLIAM TYNDALE We believe it was God who raised up John Wycliffe (1330-1384 AD) to give us the Bible in English. John used the Vulgate of Jerome as his basis. His momentous text, and then Tyndale's, along with the AV of 1611 became the basis of a codified English language. Unfortunately, The Council of Constance declared Wycliffe a heretic in 1415, banned his writings, exhumed his remains, and had his bones burned. Yet even today Wycliffe is often called the Morning Star of the Reformation of the 1500’s, since his work gave men the Bible in their own language. And when they got that Bible and read it and studied it, the word of God changed their lives, converting many of them, and the Bright and Morning star arose in their hearts. John Purvey was also involved and did some NT updates, while other workers translated the Old Testament. RENAISSANCE AND REFORMATION We should back up just a bit to get the context for this momentous period....The Turkish/Muslim invasion of Constantinople in 1453 AD, where the Eastern Greek Church (in contrast to Rome in the West) had its “headquarters” -had widespread effect. Many Greek speaking people fled to the west, carrying with them Greek manuscripts of the New Testament (a handful of these would be the same texts used to translate the Authorized Version of 1611). In Europe a great awakening of learning was taking place, which in scholarly circles- took great pains to go back to the earlier sources of learning. In christendom this led to revival of learning and inquiry with regard to the Greek (and to a lesser extent Hebrew) language. Erasmus, a humanist loosely associated with Rome, edited a version of the Greek New Testament after locating several Greek texts in monasteries. These had all come from the Byzantine Empire as mentioned above. As a side note this text type (Byzantine/Textus Receptus-today called the Majority Text) was the basis of the KJV translation, and it dominated Greek speaking Eastern (Orthodox) churches and was the underlying Greek text used by that eastern church. The Authorized Version of 1611 (based on those Greek/Byzantine texts) was not the first English Bible but soon became the standard English Bible, and codified the English language like nothing else. It was truly the greatest fruit at the tail end of the Renaissance/Reformation period. 4. A denial of the papacy, recognizing that Christ is head of the Church. 5. Sola Scriptura/Sola Fide - Scripture alone, Faith alone in Christ alone. GENEVA / KJV BIBLES With regard to the "Authorized Version" (called KJV in the USA), its commissioning took place in 1604 at the Hampton Court Conference outside of London. The reasons for the conference were complex, as there were competing interests between Puritans, Papists, Scottish Presbyterians, Non-conformists, and Parliament. One outcome of the conference was the commissioning of the new translation, to replace the previous Geneva Bible. The Geneva Bible was the English Bible the Pilgrims brought to North America on the Mayflower-also the first Bible to have numbered verses. It was largely based upon Tyndale's. About fifty of the finest language scholars set out and achieved a work that would, as King James himself said "would be read in the whole church." Their task achieved a remarkable result, though it had early opposition. The popularity of the Geneva Bible waned and the AV/KJV came to dominate. TEXT TYPES Byzantine Greek New Testament The new emphasis of learning and scholarship of the Reformation period would have many good results. It would also lead (especially later in the 1800's) some into skepticism and doubt due to the rise of rationalism and other humanistic ideas. But at its core this period of 1500-1850 led men in search of more information, which included the often delightful discovery of new Greek manuscripts. It is because of a few of these discoveries that later, in 1881, a different Greek text family would be introduced and come to (we think wrongly) dominate the English translations of the modern era. But before that, we shall go back a bit in time to understand the texts of the Greek Bible. First, let us note, in the Greek New Testament documents, of which we now have 5500+, there are two general families of texts, Alexandrian and Byzantine. By families we mean two general categories - having peculiar characteristics. The Byzantine coming from the broad area of the ancient Roman Empire, especially the Greek speaking areas (ie...think Corinth, Rome, Ephesus, Colosse, etc). These text evidence some clear cohesion in testimony as to the reading of the NT text. The Alexandrian text refers to a much smaller subset of text types with much variance in its readings, coming out of that arid part of Egypt where Origen labored. Initially, the Alexandrian texts were not used as the basis of English Bible translations, instead it was the Byzantine. Of the Byzantine Greek texts, men named Stephanus and Beza continued the exciting printing work of the Reformation period, and in 1633 a particular Greek New Testament was completed, which in its introduction said “the reader has now the received text by all in which we give nothing changed or corrupted” This became known as the Textus Receptus. This is what underlies the 1611 AV/KJV and modern NKJV, though the latter has good marginal notes exhibiting where the TR differs from both the Byz. and Alex. text types. The TR does reside under the Byzantine heading, of course. 2. 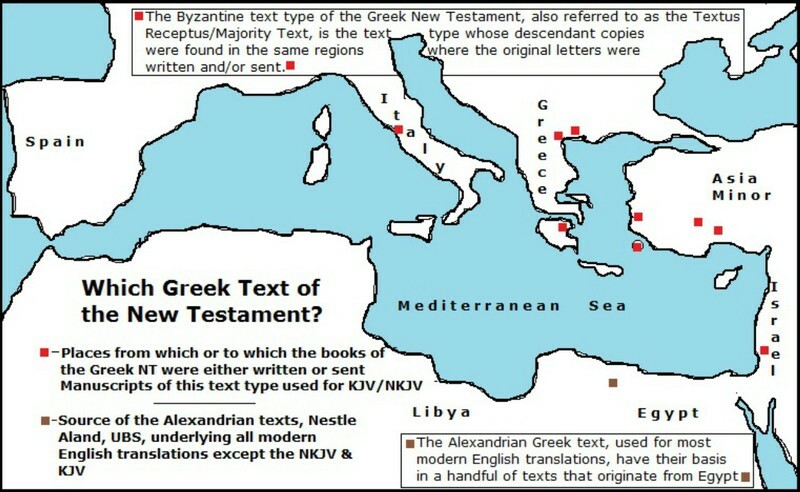 Alexandrian - Egyptian -Wescott/Hort - United Bible Society - Nestle Aland - Critical (The basis of virtually all other English translations besides NKJV/KJV) The Sinaiticus, and Vaticanus are among the better known ancient Alexandrian manuscripts. As learning grew and new discoveries were made, the Byzantine (Textus Receptus) text type began to be challenged. Two documents (categorized today as Critical/Alexandrian) of note were studied, one called Sinaiticus (pulled from a monastery trash bin) and the other, Vaticanus. (Later would be found other incomplete NT portions now known as P46, P66 and P75, etc.). These texts were deemed older than the known Byzantine text types (though far from being the originals-nor early copies from the region to which originals were sent), mainly due to their discovery/origin in the arid areas of Egypt (Alexandria) where a manuscript had less moisture to foster its decay. Soon these Egyptian documents would rise to prominence (wrongly) in Bible translation. It was thought "older is better" by a non-discerning generation of scholarship. We suggest also that peer pressure in favor of the Alexandrian text, in Academia, came to bear. The Church of England charged a committee of men in 1870 with the task of updating the English Bible (the KJV/AV/Authorized Version). A committee was formed and worked for a decade, whose key members were B.F. Wescott and J.A. Hort. Their charge from the committee was to update the English version as needed but to limit it and only make essential changes. But their intent (Hort especially, in disregard and disobedience) was to overthrow the Textus Receptus and replace it with an (Alexandrian) eclectic text-which became today's "Critical" text. They came out with a massive revision called Revised Version in 1881 and at the same time came out with that new Critical Greek text based on the Alexandrian manuscripts of Egypt. The RV was resisted and successfully exposed by men like John Burgon, the Dean of Chichester. But for better or (we believe) worse, their work would leave a lasting change in New Testament (especially) translation work that endures to this day in English and other linguistic circles. This is because that Critical text that came from the Alexandrian text type became the text of choice by modern scholars. The principles that Wescott and Hort laid down have dominated Greek Textual Criticism ever since. Textual Criticism is the science of determining the original text of scripture. It has within its pale scholars of all types, liberal & conservative, believing and skeptical. Things got off to a bad start in 1881 with the Revised version. True, some updates & changes were needed to the English of the AV/KJV Bible, as modern scholarship understood more of the history, and usage of the Greek language of the 1st century - things we should not fear. But the underlying text did not need changing-except to broaden the narrow confines of the Textus Receptus to include the overall Byzantine text (aka - known today as the Majority Text). Unfortunately in the 1900’s there was an explosion of English translations based on that Critical/Alexandrian text, including the American Standard Version of 1901, much later the NIV and NASB, and then other even more modern versions (ESV). Many of the new versions move towards popular thinking and paraphrasing. All but one were based upon the readings from the (fewer-but older) manuscripts of the Alexandrian family. The New King James (NKJV) was also completed in 1979 and is an important exception to this trend. What the NKJV translators did (publisher-Nelson) was basically to do the task that the committee of the late 1800’s disregarded. They took the Authorized Version (the KJV), and updated it where scholarship called for it. These men remained faithful to the Byzantine text type, which is the vast majority of extant manuscripts of the Greek New Testament. 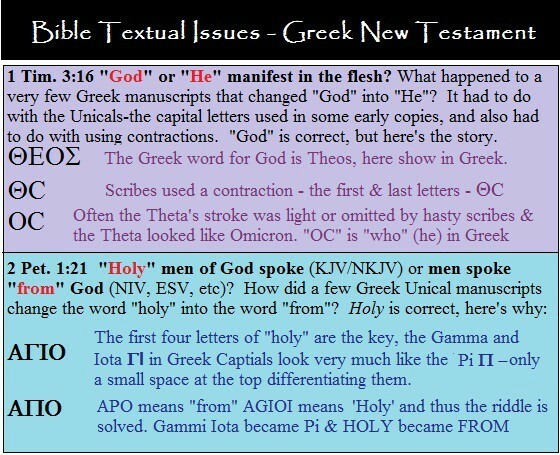 TEXT TYPES Alexandrian Greek New Testament It would be important at this juncture to explain the essential differences between the Alexandrian (also called Critical, Nestle Aland, United Bible Society) text and the Byzantine (Majority Text, Textus Receptus) text. The Byzantine text manuscripts were found throughout the Byzantine empire, which basically included much of the areas to which original NT letters were written. Since today most Bible translations come from the Alexandrian/Egyptian text as its basis, it is worth considering its validity. We quote extensively now from an article by Wilbur Pickering titled "The Text of the Church" at www.walkinhiscommandments.com. "...In "The Text of the Church?" (Trinity Journal, 1987, 8NS:131-144 [actually published Spring, 1989]), Kurt Aland offers some important evidence from the early fathers that I have not seen elsewhere. It is a fascinating article wherein Aland is concerned to argue that the "Majority text" could not represent the original, that honor being reserved for the "Egyptian text." Such a conclusion is not new, but the evidence that Aland himself has presented deserves a careful scrutiny—is that really the story that it tells? By way of background I will start with some observations that Aland makes about the early Egyptian church. "The earliest form of the New Testament text in Egypt obviously had its origins outside Egypt" (p. 138). Of necessity, since Egypt did not possess any Autographs. This means that the textual tradition in Egypt was second-hand from the start. Then Aland informs us that "at the close of the 2nd century" the Egyptian church was "dominantly gnostic" and goes on to state: "The copies existing in the gnostic communities could not be used [by bishop Demetrius], because they were under suspicion of being corrupt" (p. 138). That is food for thought indeed, and one wonders why academia follows almost slavishly the Alexandrian text type? p46 is a champion text of this text type, but is Alexandrian, and dates to 200 AD. We should at this point help the less familiar reader in an important way. That is, does this mean our Bibles (those not based on Byzantine texts) are greatly suspect? Is the Alexandrian text type that bad? Let us give some context. the Alexandrian text is at times shorter on passages with variances to the Byzantine. The question is then whether a longer passage is an elaboration or the shorter one is a condensing. The Alexandrian text has the most common corruptions that are at times materially confusing and illegible. It is awkward and astonishing to find scholars considering the more corrupt text to be more valid, merely due to its age - while ignoring its obvious lack of quality. Homoeoteleuton - likeness of ending. (a scribe copying one document onto his own parchment or papyrus and when the eye moves back and forth he might see and line 3 the same letters ending a word where he was actually copying from in line 2, and skip everything in between in his copy. Itacism - the scribe may not have full knowledge of the language (Greek) or for other reasons introduces something minor in the text to help clarify meaning. Liturgical Influence - Lectionaries grew in popularity and their use sometimes demanded (since they were readers of scripture portions) introduction of material into the text since starting a "reading" in the middle might make it incoherent. Later, some lectionaries influenced various scribal copies made, especially in periods of great persecution scripture destruction by Roman authorities. Harmonistic influences: Like todays "Harmony of the gospels" there were periods where men tried to make seeming variances in the 4 gospel accounts to be more coherent and would borrow data from the other gospel stories and import them into another gospel. There were some instances of detectable purposeful changes, by heretic and orthodox alike, but in the end, the student of the Bible should rest assured that the 5500+ Greek New Testament manuscript portions extant today are exceptional witnesses to the integrity of the text. Ultimately the original text is the God-breathed document, and the goal of the English translator is to be faithful to the Greek NT (and Hebrew OT) and give it as faithfully as possible to the English reader. We have achieved a great deal of success on this front. Keep in mind at this point, that we affirm without hesitation that the original autographs of all 66 books are infallible, and absolutely inerrant. The Alexandrian texts are older than most of the Byzantine copies (keep in mind though that the oldest copies are the originals-which we do not have). Many believe their non-use and at times a very corrupt quality- contributed to their "survival". The Alexandrian text types have a serious flaw in that they are not coherent in their witness. In other words, where they differ within their own circle compared to the Byzantine, the Alexandrians have weak or often no coherent agreement among themselves. They testify to a state of flux, and in our opinion are therefore suspect witnesses. Astonishingly, scholars today look favorably upon the Alexandrian text type, though there is has been an encouraging move to be more inclusive of Byzantine readings. Peer pressure in academia is a hindrance to progress. Ostracism of dissent has often been the bane of academia. The Byzantine texts were more widespread and were found in the regions where the originals were first sent (ie…Rome, Corinth, Thessalonica, etc., of Europe/Asia Minor). This was where the Greek language dominated until the Muslim invasions, which is when the Greek texts moved west with those fleeing and became the objects of study for the Renaissance and Reformation. The region from whence Byzantine texts came were more moist and old copies could not survive-but copies flourished-testifying to older ancestors. And their geographic distribution also speaks of a breadth of origin, rather than a local centre that generated them (which did not happen). The Byzantine texts make up 90+% of the extant copies. After the mid 4th century, the Byzantine text type dominated for 1400 years. The Byzantine text type is far more harmonious than the Alexandrian and provides a clear witness to an easier to identify original. The Byzantine text type may be likened to 900 witnesses under age 60 in a court that give consistent and coherent testimony to a matter being settled in court. The remaining 20 witnesses (Alexandrians-over the age of 80) have an eclectic testimony. In the few (and they are few) substantive areas where they disagree with the Byzantine witnesses, they also disagree with each other. Their details differ and there seems at times to be a senility among these venerated witnesses. If the Alexandrian text type be representative the original, then none of them accurately presents the originals, it cannot be compiled except by piece-meal ecclecticism of a patchwork text like Nestle-Aland and UBS. If the Byzantine represents the originals, there are many copies therein that can be argued represent the originals. This is an astonishing point to consider. Beyond these three issues, the textual variants are real, and at times are tedious, but one is hard pressed to really find variances of significance that adversely affect the clear transmission of scriptures and any doctrines we have in hand today. We can rest assured with full confidence that the scriptures have been preserved, marvelously so, despite the claims of unbelieving men who are bent upon destruction rather than truth. This is by no means a denial of the need for further study and (believing) textual work, rather it is an astonishing resting place that God has indeed preserved His Word. Progress is possible in the Byzantine stream though, not in the eclectic uncertainties of present academia. Once the underlying Greek New Testament text is settled (Byzantine priority), the question then is, how is the translation into another language done? What are the principles involved? Paraphrase, which is full bias of the translator (Living Bible, the Message) Many modern translations are deplorable mixes of dynamic equivalence and paraphrase and contribute to a bad state of flux for English Bibles. The massive challenge of grammar and syntax from one language to another, a Herculean task. We should be thankful to them that have labored thus. CONCLUSION We have in our hands what in the originals was a God-breathed book- we have it very reliably translated into English. In a skeptic driven world we must honestly face the reality of the missing originals, yet we can stand without hesitation for the veracity of the Bible in its originals. Along those lines we have very good reason to have high confidence in our English Bibles (KJV and NKJV are recommended-based on the Bzyantine texts). We can say without hesitation, "this is the word of God." Some other modern translations are very good in their translation work, but due to using the Alexandrian/eclectic Greek text as their basis, are not recommended as "primary" English texts. We need not be cowered by popular misinformation such as men who say that the “Bible has been translated so many times, it is impossible to know its meaning”. This is a gross misrepresentation of the facts and as we say in the vernacular, is a "cop out". We can rest assured that interpretation based on a good translation is not impossible, and on the contrary is one of the great joys of Christian living - to learn the mind of God and see Christ revealed in the scriptures. We aren't left in Eden hiding behind fig leaves of ignorance, nor are we cowered by the serpent's hiss "yea hath God said?". The mind of God can be known by the illumination of the Holy Spirit as we come to know Christ and read His Word. Hebrews 1: 1-2 says: God, who at various times and in various ways spoke in time past to the fathers by the prophets, hath in these last days spoken to us in His Son. Psalm 119:105 Thy word is a lamp unto my feet and a light unto my path. The New Testament was written perhaps exclusively in Greek, no proofs conclusively show otherwise. Various movement seek to make a Hebrew or Aramaic source argument but the proof is lacking and the motivations are spurious. Hebrews is one likely candidate written in Hebrew & translated by Luke to Greek. Many 1st century people would have been bi-lingual, speaking Greek and their local language. In Rome, it would be Latin & Greek. Like today's English is a language of commerce or Swahili is such in parts of east Africa. Aramaic and Greek would have been the languages of those in Israel in the first century, with the Romans using Latin as well. 1. Norman Geisler's "From God To Us: How we got our Bible" (Nix). 2. JN Darby's preface to his "New Translation"
3. Wilber Pickerings "The Identity of the Greek New Testament Text"
4. John Burgon's works "Revision Revised" and "The causes of corruption of the NT Text"
postscript: A main emphasis of this article is towards the New Testament. There is, admittedly, much interest in the LXX and Masoretic text background with regard to NT quotations from the OT, and the overall use and methodology of translating the Old Testament...this information is not primarily taken into account in this article and that is recognized. Also, there is no bibliography herein, pardon requested as the author had time limits. Much was borrowed indirectly from memory or from the works and thinking of those listed above. Appendix 1 : Problematic Facts about Codex Sinaiticus. 1. It bears the differing handwriting of multiple scribes (4) and more corrector's hands than can be identified. 2. Missing are all but 4 chapters of Genesis. 16. Tischendorf is said to have counted 14,800 alterations/corrections in the MSS. 20. How can this document be a key witness to the original text?